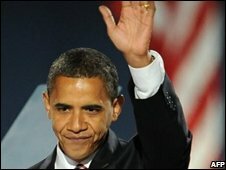 China's government has urged America's new president-elect, Barack Obama, to oppose independence for Taiwan. A foreign ministry spokesman said the issue was key to good relations. The demand comes after Taiwan's President Ma Ying-jeou held a brief but historic meeting with a senior Chinese envoy in the Taiwanese capital, Taipei. But the meeting was vehemently opposed by thousands of protesters, who object to the closer trade and economic ties agreed in a deal this week. Taiwan has been ruled separately since the end of the Chinese civil in 1949; the defeated Kuomintang retreated to Taiwan to create a self-governing entity. But Beijing sees the island as a breakaway province which should be reunified, by force if necessary. "We urge the United States to honour its commitment... honour the one-China policy and stop selling weapons to Taiwan," ministry spokesman Qin Gang told journalists in Beijing, after being asked to comment on US-China relations following Mr Obama's election win. "Judging from the development of bilateral relations in the past years, the Taiwan issue is the most sensitive issue." It has already been US policy to uphold the one-China principle which sees Taiwan as part of mainland China. But it is such an important issue to the Chinese that they take every opportunity to restate it - and to ask others to restate it - says a BBC China correspondent Chris Hogg. Earlier this year, one of the president-elect's senior foreign policy advisers made clear there were no plans for the Obama administration to change tack on this issue, he adds. Last month the Bush administration told Congress it planned to sell more than $6bn (£3.8bn) worth of weapons to Taipei - prompting a furious reaction from China, and the subsequent cancellation of some some military and diplomatic exchanges, according to US officials. Mr Qin's remarks come amid a five-day visit to Taiwan by Chen Yunlin, the most senior Communist Chinese official to visit the island since 1949. Earlier in the week, Mr Chen agreed a landmark deal to improve direct trade and transport links, and on Thursday, he held a short but historic meeting with President Ma. 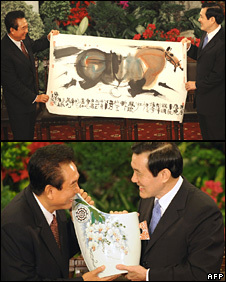 The two made a few cordial remarks as they exchanged gifts - a painting of a horse for President Ma (whose name means "horse" in Chinese), and a ceramic vase for Mr Chen. But Mr Chen's avoidance of the term "president" when addressing Mr Ma - a term Beijing considers would suggest Taiwan's independence - infuriated protesters gathered outside the government guesthouse where they met. "This shows that China is only treating Taiwan like a local government," said Chang Bang-ni, a middle-aged businesswoman demonstrating outside. Some protesters' sole concern is the perceived threat to Taiwanese sovereignty posed by China. But some also voiced fears that closer economic ties with China could mean jobs lost on the island to the cheaper market on the other side of the Taiwan Strait. President Ma says this week's deal "symbolises a major step forward for cross-strait ties," and will "contribute to cross-strait stability and prosperity". "But we cannot deny that differences and challenges still exist, such as Taiwan's security and Taiwan's position in the international community," he said in comments broadcast live. "In the future, both sides should see the reality and should not deny each other's existence in order to promote the welfare of the people and cross-strait peace and to resolve our differences." Mr Chen's visit has attracted daily protests since it began on Monday, and thousands of police have been deployed to ensure his safety. 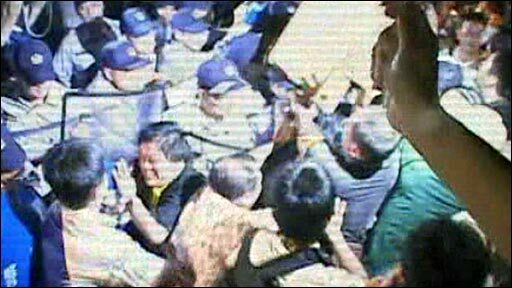 On Wednesday night, crowds mobbed the hotel in which Mr Chen was eating, preventing him from leaving the building until well after midnight. Last month, his deputy Zhang Mingqing was knocked to the ground by protesters during a visit.